RME User Forum → FireWire & USB series → USB recording media recommendation for UFX - pen drives etc. Re: USB recording media recommendation for UFX - pen drives etc. Full channel 96 test 76-84 access times, ~80 percent load, not errors after two hours and drive is not even warm. Don't use the the supplied cable as it is a very tight fit. Same results as Sandisk above, but runs quite warm, even with the metallic body. ORICO USB3.0 to SATA III 2.5" External Hard Drive Enclosure for 7mm and 9.5mm 2.5 Inch SATA HDD/SSD Tool Free [UASP Supported] Budget SSD case, tool free, works great with my old SSD drives when I upgrade them. Even my very old Intel SSD drives work fine. Slightly better results in terms of access times than the 128gb, even though technically a slower model. Does not run as hot as the 128. They are selling these for cheap on Amazon through Blue Proton. They are "refurbished," lightweight. That's a nice and useful info, thanks. Unfortunately this offer seems to be limited to Amazon US. Many thanks indeed. Was this tested on UFX or UFX II/+? Just the plain old UFX. I actually liked the preamps on this unit. Hi Joost, are you able to clarify whether you did indeed test these? MC didn’t have such luck. Thanks! Anyone tried Samsung's external SSDs eg T5? Not personally, but I was just told they are quite good. Generally, SSDs will perform fine, as they don't have these issues with pausing that some USB pen drives do. The same applies to SD card readers. I just put an inexpensive M.2 drive (128 GB, got it for 22 Euros) into a solid external USB 3.0 enclosure (Inateck, 15 Euros). Write speed on a small laptop is arround 150 MB/s, plenty... Should also work fine on a UFX. I've been using 1x SanDisk Extreme Pro Solid State Flash USB drive (USB 3.0 version) and 2 x SanDisk Extreme Pro Solid State Flash USB drive (USB 3.1 version) for at least a year for recording. They have probably been used about twice a month, normally filling them completely, then copying the audio to another drive later for backup. Then, I format the drives using a quick format using "FAT32 format" (GUIformat tool). All this has worked fine until a few weeks back. I was recording a high track-count event (32 channels at 24/96). I started to notice the usage was going up and down (way above 100%) and many errors were noted. I tried one of the other USB sticks, and it also produced errors, though it seemed to only produce them when the drive was almost empty, or almost full. (These were the USB 3.1 version - the USB 3.0 seemed to be better, strangely). So, the question is, will these sticks need replacing after a year or so of use? Other factors, it was a very hot day - but probably irrelevant. I tried back in a studio setup and still had the same errrors with this stick. I've also tried a full (non quick) format, but still not looking good. Also - are the 256GB SanDisk Extreme Pro sticks recommended now? Having problems formatting a new Sandisk Extreme Pro USB 3.1 stick on our Mac. Can anyone advise? The disk wasn't recognised by the Mac but I managed to format to ExFAT on a Windows PC. The Mac began reading it okay but our UFX still can't read it. You will need FAT32.... There is Windows software to do this, I'm sure this thread has links. I used OSX Terminal to format the drive to FAT32 and the UFX still says 'File System Error'. Should we be using the GUID partition scheme or Master boot record? I use a Windows machine to format my pen drives to FAT32, using "GUIformat" from Ridgecrop Consultants. It works perfectly. Okay I got the new SanDisk Extreme Pro 128GB USB stick to work in my UFX, and unfortunately it shows inferior performance to the previous silver generation of USB stick. 12 channels at 192k pushed it over 100% and produced errors, whereas the old one still manages 16 channels at 192k at a steady 75%. It claims read and write speeds are almost twice as fast as the previous generation, so either I've been sold a fake, or the average write speeds aren't continuously fast enough. Anyone else managed to make this stick work? 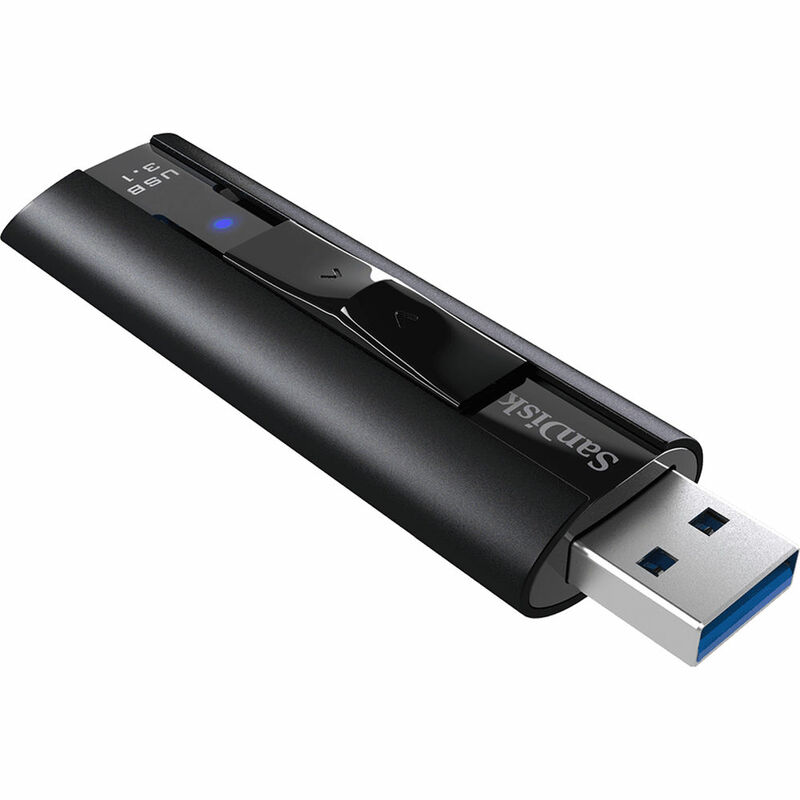 That's the exact one I have, the SanDisk SDCZ880-128G-G46 Extreme PRO 128GB USB 3.1, and it works perfectly. Just recorded a live show with with 24 channels. Over 4 hours of recording time with zero errors. I've done tests with it using 28 channels with zero errors as well. Granted I'm recording at 44.1, so if I were at 96 things might be different. But so far I'm happy. Thanks Gabo. The stick works at lower capacity, however it would be really helpful if you can test the maximum channel count as described earlier in this thread so I can work out whether my stick is defective or not! I had a chance to check the DUREC recording at 192K with the SanDisk SDCZ880-128G-G46 Extreme PRO 128GB USB 3.1. I feel confident that this USB drive works well. I tried SanDisk Ultra Fit USB 3.1 Flash Drives today, 32GB and 64GB version, 16 channels @96k on my UFXII: Not a single drop for several hours (load round 35% +/- 15), no issues at file boundaries - and they don't heat up either (I tested 4 pcs in total: 3x 32GB and 1x 64GB). I can highly recommend these, as they are tiny, too, and do not protrude more than 1 cm from the front panel! We heard that before. It seems the new 3.1 Ultra Fit are different compared to the former 3.0 Ultra Fit. I will buy a few to verify this. Thanks for the info. Bought another one today, 64GB: Same good performance - just for fun I drove it to the limits, 16 channels @192k - operating at 90% HD, but no errors for 15min, not even at file boundaries. Wouldn't call that a save operation mode though, and indeed first errors popped up as 15min recording passed without a flaw... but with 16ch @96k there seems plenty of headroom. no errors for 15min, not even at file boundaries. Wouldn't call that a save operation mode though, and indeed first errors popped up as 15min recording passed without a flaw... but with 16ch @96k there seems plenty of headroom. Thanks Tom. Just to clarify, are you saying there were errors after 15min? 16 channels @192k: obviously too much (HD average 90%), first errors after 15 min, however it crossed several file boundaries error free before - so file boundaries do not seem to be an issue with these, which is good to know! 16 channels @192k, which collapsed after a view seconds already on the 'Samsung USB 3.1 FIT Plus 64GB'. For DUREC recording I still highly recommend the 'SanDisk Ultra Fit USB 3.1' for up to 16 channels @96k. Lessons learned: Paper specs is not enough to guarantee flawless DUREC recording. By the way: Newer generation 'Intenso' 3.0 'micro line' sticks did not work at all (sloppy even at 4 channels @96kHz, some stop the whole recording at file boundaries), clearly avoid these for DUREC recording. Thanks Daniel. I'm afraid I'm struggling with a decent SD card reader purchased from Amazon. The UFX won't recognise it despite multiple attempts to re-format/partition etc the SD card. Do you have a definitive guide to Fat32 formatting on a Mac? 0) If you are lucky enough to still operate a good old macbook or mac with SD card slot, use this. If you use an external card reader, first make sure it actually works with your mac (Unix-like operating systems as OSX typically have the drivers for such devices integrated in the kernel - or not... if not, there's little you can do on a mac). 2) In the menue on the left side, select your memory to re-format; make sure you chose the correct one since all old data on it will be LOST! 4) From the pop up menue which appeared, chose 'FAT32'. Note you can only chose FAT32 from the pulldown menue in case your memory is not already formated with FAT32. If it is formated in FAT32 already and you want to reformat never the less (for whatever reason), chose something else (for example ExFAT) first, then redo all steps with FAT32 in a 2nd cycle. 6) Once DiskUtility succeeded it will prompt you so. Write speeds on the PC aren't very high, only about 20 MB/s, read speed is about 130. Recording works well, to a degree. 60 channels @ 48k are too much, the disk use percentage goes up to 100 and beyond. In a realistic scenario with all inputs recording (30 channels), the figure remains quite stable at between 40 and 50%, and there were no errors even diring prolonged recording. I think I had one error at 38 channels (all inputs and analog outputs). UFX+ results: 5 errors within 10 minutes at 46 channels (Analog, ADAT, 16 MADI). 30 channels without errors so far. I also tested this Sandisk drive, which recently sold for €12 (64 GB), but it produced two errors within 7 minutes or so (at 38 channels), so I don't think it's really usable. I have recently tried using SanDisk SD cards with success (which were originally purchased for another purpose). However, I would like to purchase 128GB or even 256GB SD cards now I have proved this works. Should I go for the higher spec 170 MB/s transfer (which are not THAT much more expensive!) or am I fine to stick with the 95 MB/s as they seemed to work just fine? Please let me know any thoughts! Do you mind me asking which SD card reader you use and exactly how you format the media? Ie OS, format etc? I use a Windows PC (either running Windows 7 or Windows 10) machine to format these cards to FAT32, using "GUIformat" from Ridgecrop Consultants. I hope this helps. My inclination is to choose the most modern up to date type like USB Type-C to USB-A Male 3.1 Gen2 Cable .